Wind turbines have a capacity of however megawatts. This is always quoted by the Government and the Industry but what does it really mean. At optimum wind speeds the turbines will produce to capacity but at sustained wind speeds over 25 and gusts of 34m/sec(55-76mph) they close down to protect the equipement. So they always are generating power? Another quote from the pro wind commentators. Well not actually. 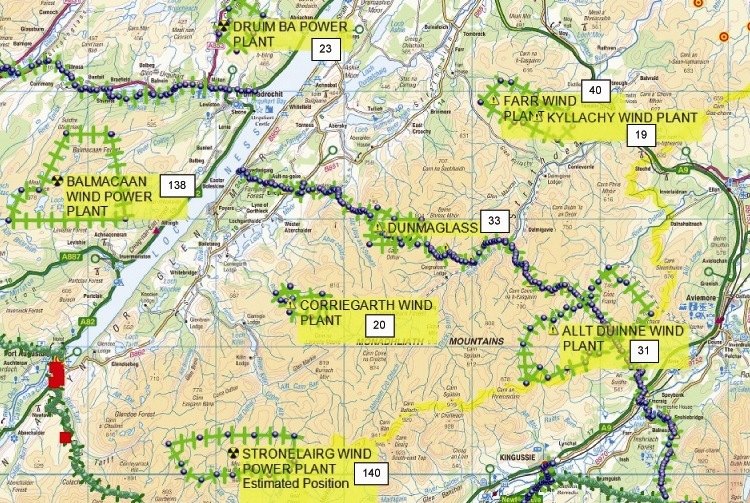 For this exercise we will take the data provided by Enercon* for their 3MW turbines. To confuse matters there are two models quoted, the E82 and E101. Essentially until wind speeds rise to above 38mph (Gale Force 8 on the Beaufort Scale) they are producing at below capacity. However the E101 does show a greater effiency reaching optimum performance at only 27mph. The difference is basically the rotor diameter. Oh, and cost! the E8 has a rotor dia of 82m, the E101 a rotor diameter of 101m. Concentrating on the smaller and more common turbine we see the performance drop off steeply at 29mph w/s producing 2.48mw, 22mph producing 1.58mw and at 18mph w/s a much lower 815kw. 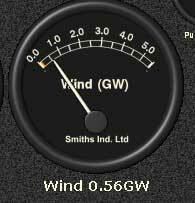 At wind speeds more usually seen of 7/8mph the ouput would be 25/37kw according to which model. Below this speed, although the turbine may be turning, virtually no exportable power will be generated. It should be always taken into account that whatever is generated at the turbine is not the usable electricity as line loss and switching loss will degrade the supply further (>7/8%). Percentages are lost according to the distance away from the consumer that the wind farm is. However, back to generation. Effectively the higher the turbine is sited, the windier the conditions. However wind is effectively air moving from one area of pressure to another. The wider the isobars the lower the wind speed. Height and size of the turbine make no difference. If the wind isn’t blowing above Beaufort 5, the amount of power generated will always be limited. As you will see from the graphic, this is quite a windy day. Never forget that for the many days, particularly when High Pressure systems sit over the British Isles and, sometimes, the whole of Europe, the wind will simply not blow. In those conditions wind power will not generate anyelectricity at all. It becomes a net consumer. Consistent mis-statements that the wind is always blowing somewhere in the UK are absurd and ill informed. The absurdity of the argument being the requirement that each part of the UK would need the generating capacity of the whole. Demonstrably a physical impossibilty, never mind the lack of grid capacity to handle that sort of power transferrence. Back to basics. The Enercon system is direct drive so is intrinsically more efficient than many other systems. The losses through gearing are, if not eradicated, certainly reduced. 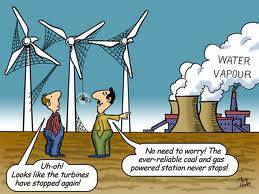 Other systems will have different power to wind ratios and it is possible to optimise turbines to sites. However the basics are simply those un-changeable laws of Physics. 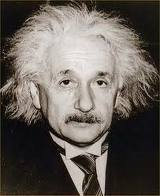 Turbine efficiency is governed by Betz Law, after Albert Betz http://en.wikipedia.org/wiki/Betz’_law . 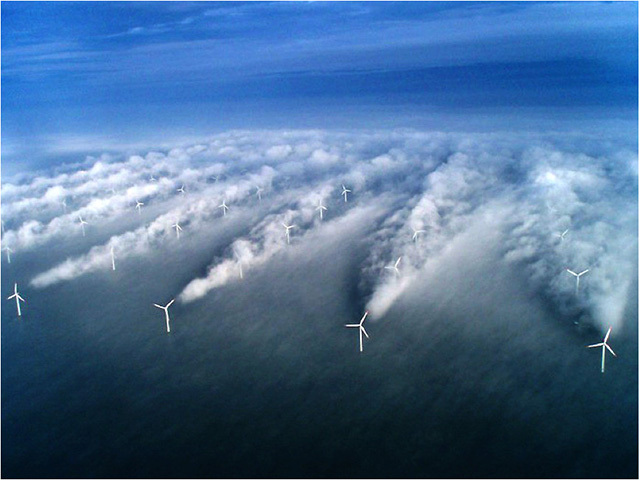 The intermittancy of wind effects the reliance on wind as a sustainable power source. Renewable has as must credibility here as perpetual motion. Wind speeds can drop in seconds necessitating a high level of spinning reserve. Wind will never be demand led. It blows as conditions dictate. We have all been kept awake by a howling gale, when demand is lowest, to wake to a clear calm morning, when power is needed to provide our early morning cuppas and power industry. Let us put some facts behind the hype. In the Stuart Young report for the John Muir Trust it is possible to extrapolate some basic facts. 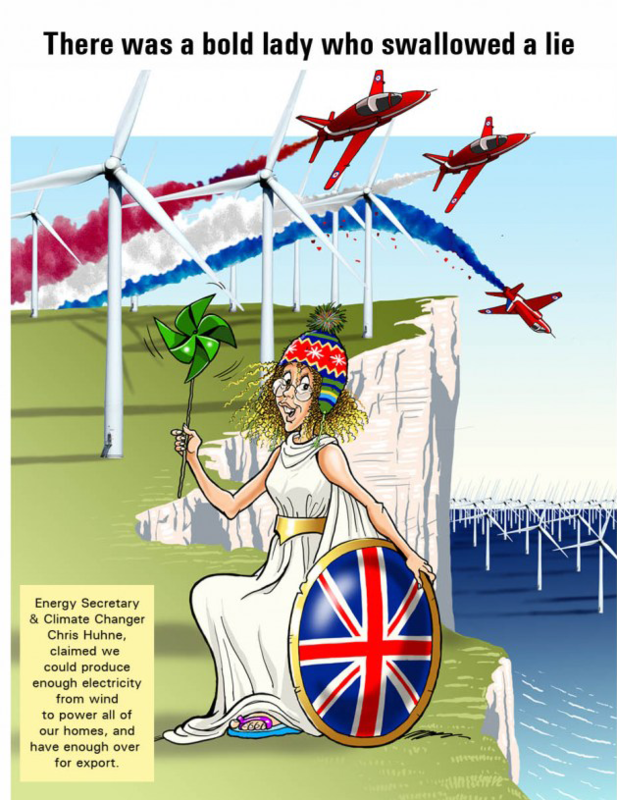 Over the past two years UK wind turbines metered by the National Grid ran at just 10 per cent of capacity for more than one-third of the time. And they ran at less than 20 per cent of their capacity for more than half the time. It said that once a week on average the wind dropped so low that the turbines produced enough energy for “a mere 6,667 households to boil their kettles for a cup of tea”. During the four highest peak demands last year, the best wind could manage was 5.5 per cent of capacity. Why, therefore, do the Ministers and does the wind industry continually promote Capacity when the figure that is relevant is deliverable energy. Effectively it is little more than smoke and mirrors. Total Capacity is around 3.696 gigawatts[NETA ] of which average deliverable wind energy is about 776 megawatts. Maximum output is rarely above 2.4 gigawatts. Statements that the wind always blows somewhere in the UK, patently incorrect, are balanced by fact that it rarely blows everywhere in the UK. 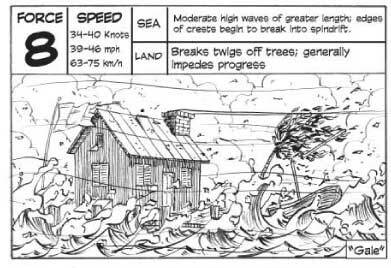 Windy conditions, in contrast to calm conditions, are mostly driven by far smaller more localised meteorlogical conditions. Remember the basics again. Closer the isobars, greater the wind. Yes, you may say, but the wind does blow in Scotland. This creates it’s own concerns. As we have seen the higher the turbines, the better. 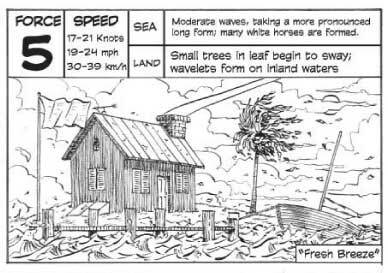 Problem is that at the higher spots wind can be very strong. The Cairn Gorm plateau regularly experiences wind speeds in excess of 100mph with the highest wind recorded in 1986 of 176mph. As seen from the recent hurricane in the US, even at speeds far lower than these serious damage or even destruction can occur. However the belief that Scotland has regular windy conditions are often over stated. One might remark that our second best known indigenous species, Culicoidas Impactatus (the Scottish Midge) is a serious impediment to our tourist industry, but does not fly at wind speeds above 8mph(3.6m/sec). Actually below the minimum speeds for most wind turbines. For those that suggest the midges aren’t found on the tops of mountains, ask any hill walker or mountaineer and expect a fairly robust agricultural response. The fact of midges being such a problem in the summer, when temperatures are condusive to them, suggests that wind speeds are low or calm for a considerable period of time. Oh, and Scotlands premier indigenous species? Nessiteras rhombopteryx – The Loch Ness Monster!